The Kansas State Wildcats baseball team is a member of the NCAA and the Big 12 Conference. The program's first official game was in 1897. The Wildcats have advanced to the NCAA baseball tournament four of the past six seasons. Following the completion of the 2017 season, Kansas State's all-time record is 1,812–1,803–10 (.501). Kansas State plays its home games at Frank Myers Field at Tointon Family Stadium. The stadium was built in 1961, and re-dedicated in 2002 with major improvements including a digital scoreboard, upgraded locker-room facilities, coaches' offices, and more. The team's first official home field was an open public square in Manhattan located at Bluemont Avenue and 8th Street, which it began using in the 1898 season, called Athletic Field. Construction of Bluemont Elementary School on that plot of land forced Kansas State to move its athletics on campus beginning in 1911. The team's on-campus baseball diamond was initially located at the southwest corner of the campus, at the current location of Memorial Stadium. However, in the following decades the squad played at numerous locations around Manhattan, including City Park and (for many years) Griffith Park, before the opening of the current ballpark. According to most sources, Kansas State began intercollegiate competition with a match against St. Mary's College on May 26, 1894. (St. Mary's was a regional athletics powerhouse, whose recent graduates included baseball pioneers Charles Comiskey and Ted Sullivan.) However, the first game reflected in the school's official history is a 4–3 win over Fort Riley on April 10, 1897. 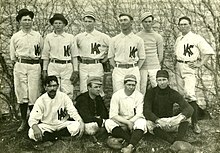 Playing in the old Kansas Intercollegiate Athletic Association, the baseball team earned its first varsity championship in 1907 under coach Mike Ahearn. After joining the Missouri Valley Conference in 1913, the Kansas State baseball team won major conference titles in 1928, 1930 and 1933. The school's most recent championship was the Big 12 Conference regular season championship in 2013. Kansas State's best finish at the Big 12 Conference Baseball Tournament was runner-up at the 2008 tournament. Transcending results on the field, the team established an important milestone when Kansas State catcher Earl Woods, the father of golfer Tiger Woods, became the first African-American baseball player in the Big Seven Conference in 1951. The Wildcats have established a number of firsts for the program in recent years. The team qualified for its first NCAA Tournament in 2009, and has returned three times since. Kansas State also earned its first national rankings in the USA Today/ESPN Coach's Poll in 2009, and set a new school record for wins with 43 in 2009, breaking the previous mark of 35 set in 1976. In 2013, the Wildcats won the Big 12 Conference title and reestablished a new team record for wins. The school also was awarded the right to host the program's first NCAA regional. After winning the Manhattan Regional, Kansas State advanced to its first ever NCAA Super Regional. The team played at the Corvallis Super Regional, falling to the host and Pac-12 champion Oregon State Beavers. Kansas State finished ranked in the top 15 of all the major polls, the team's highest final rankings in history. Craig Wilson played for the U.S. baseball team at the 1992 Olympics. Kansas State's main rival is the Kansas Jayhawks. The teams play every year in the Sunflower Showdown. As of the 2017 Major League Baseball Draft, 47 Wildcats have been drafted under the tutelage of current coach Brad Hill. 12 former Wildcats have played at least one game in the Majors. ^ Kansas State University Brand Guide (PDF). Retrieved June 27, 2016. ^ a b c d Willard, Julius (1940). History of Kansas State College of Agriculture and Applied Science. Kansas State College Press. ^ Olson, Kevin (2012). Frontier Manhattan. University Press of Kansas. p. 196. ISBN 978-0-7006-1832-3. ^ a b c "Wildcat Baseball Through the Years". Retrieved 2013-06-04. ^ Woods, Earl; McDaniel, Pete (1997). Training a Tiger: A Father's Guide to Raising a Winner in Both Golf and Life. HarperCollins. ISBN 978-0-06-270178-7. ^ "Tiger Woods' Father, Earl, Succumbs to Cancer". Retrieved 2013-06-09. ^ "Kansas State baseball: Times have changed". Archived from the original on 2013-01-27. Retrieved 2010-06-03. ^ Willard, Julius (1940). History of Kansas State College of Agriculture and Applied Science. Kansas State College Press. pp. 499, 505–06.